In the spirit of BFF, WIT is hosting this mixer to keep our friendships going. We hope to see you there! Great affordable food is available for purchase from the restaurant. 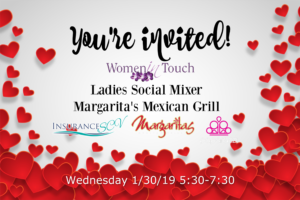 A one drink minimum is suggested to support Margarita’s, as there is no cover charge for this event and Margarita’s has graciously provided the room. We hope to support them as much as possible.